For me the memories of the years in which Prabhupada actually walked among us are bittersweet. Although I know that he is in his books, I miss him. People often say that life is full of miracles. Life itself is a miracle. But the fact that this great and humble servant of the Supreme Lord came here, alone just for our benefit, is a miracle like no others. He used to spend weeks at a time here at New Dwarka. During his stay he would engage all of us in various different ways. One time I happened to be standing across the street from the temple with a few young children. Being at the right place at the right time, we all watched, transfixed, as Srila Prabhupada appeared and began rapidly crossing the street somewhat towards us on his way to the BBT Press building. He was flanked by a few Press devotees. There was a lot going on then with money and deadline problems and his mood seemed serious. All of a sudden he changed directions and walked towards us. He stopped, looked at me, pointed to a little three year-old boy named Gopal and said, "He is not wearing neck beads. You can take care of this?" Before I could even finish my "Yes, Srila Prabhupada" he was gone. Of course I was delighted to have been spoken to and engaged by my beloved gurudeva, but as I rushed around to find neck beads I also realized how every aspect of Krishna Consciousness was noticed and important, whether it was getting the books into every town and village down to the smaller details like tilak and neck beads and Vaisnava dress. Often the knowledge that Prabhupada was right across the street and that I was going to see him and hear him give class again the very following morning was so overwhelmingly exciting that I could not sleep. So I would stay up and secretly make and gift wrap little presents for him. I'd fill a jar with rasagullas or box up little tulasi-manjari garlands for his deities. One time I found saffron-colored cashmere socks in Beverly Hills. I'd wrap each gift in pretty white tissue paper and colored ribbons and discretely make sure that someone put them right next to the vyasasana. Then I'd sit up in the balcony and wait. Sure enough, at some point after giving class he would notice a present and motion to have it handed to him. Each time he seemed to enjoy opening the gift and seeing the surprise inside. This would absolutely thrill me. I would think, "Who cares if I don't get to go on morning walks. I get to wrap presents and watch Srila Prabhupada open them. What could be more fun in all the three worlds?" 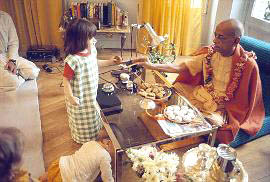 One of my most nectarean engagements was helping to make the Prabhupada cookies that he would hand out each morning. That is a whole other story that I will write in about at another time. Before I end I want to say that there are many spiritual masters now, and I try not to judge or compare them to our Prabhupada. I am glad people are becoming enlivened in spiritual life. But for myself, I want to make sure that I stay as close to the fruits of Srila Prabhupada's labors as possible. He wanted us to attend as many Rathayatras as possible, to read and distribute his books and to hold on tight to each others' association within his beloved International Society for Krishna Consciousness (ISKCON). That's what I'm going to do. Thank you.